Tell us how you first met? who what when where why? give us the dirty details. We met during our first year of law school at University of Miami School of Law. John was one of the most talkative people outside of class, always hanging out in the courtyard. He would come sit where Jenn was sitting and would talk and talk and talk, even if she was trying to study! We began hanging out more and more, and the rest is history. John wanted to propose at Vizcaya. We went there on a Saturday afternoon, but all Jenn wanted to do was go eat lunch. She was "hangry" the entire time, and did not enjoy the museum or gardens as much as John hoped she would. She also had her suspicions the whole time, and kept looking around for family, friends, or a photographer! Although John had the ring with him the entire afternoon, he later said he could not propose at a place that Jenn did not love! So instead, the next afternoon, while we were watching Tiger Woods play golf, John got down on one knee in our living room and popped the question. Jenn was truly shocked, and it was the perfect proposal. Tell us the one thing you love most about each other. John: She refines me and is the glue that holds our family unit together. Jenn: He always encourages me and can make even the toughest days brighter. Besides getting married - whats the one thing you are looking forward to on your wedding day? We are looking forward to seeing all of our closest friends and family share in our happiness. We want the entire experience to be as exciting for everyone else as it is for us! 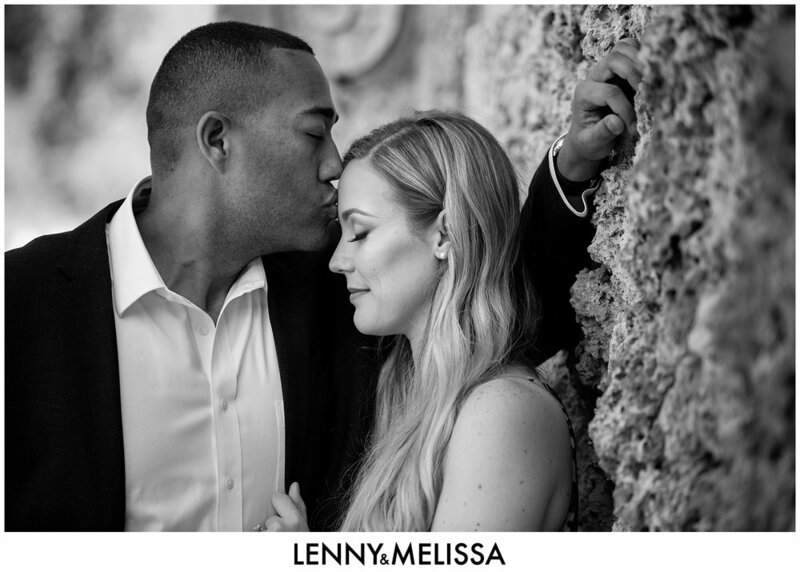 What was your favorite part about your engagement session with Lenny & Melissa? Our favorite part was actually the reveal! We had so much anticipation built up to see our first engagement photos and had no idea what to expect. The first thing Lenny and Melissa showed us was our custom slideshow. It gave us both goosebumps as we watched, and almost brought Jenn to tears. As we went through every single photo, we could both remember taking each one. 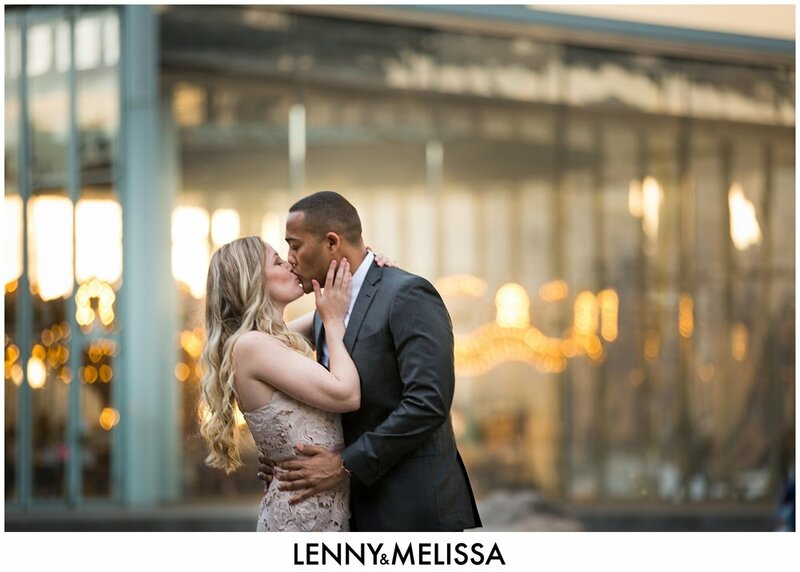 We remembered what Lenny and Melissa told us for each shot, and we were able to relive the day through the photos. Although narrowing down the photos was very tough, we loved going through each and every one. The funniest moment was definitely when a mosquito landed on John's head during a pose. Jenn saw it, but held her pose and did not swat it away! After Lenny said he had the shot, she smacked the bug off John's head. Afterward, everyone said she should have done it as Lenny was shooting. It would have made for a pretty funny photo! Going into wedding planning, we knew that photography was one of the most important things to us. Photos are forever, so we had high expectations. As we drove to Vizcaya for our session, we were nervous because we have never taken professional photographs before. We were unsure what to expect in terms of how to stand, where to stand, where to put our arms, where to put our legs, where to look, etc. However, as soon as we started, Lenny and Melissa made it so easy. They walked us through every single shot, telling us exactly what to do. They gave us tips and pointers throughout, and made the entire experience enjoyable! Oh and we are obsessed with the final pictures!!! Absolutely! We feel like pros now, especially after two engagement sessions! What do you think future clients should know about the experience you've had with us? Our engagement photos exceeded our expectations. We enjoyed every moment of the sessions, and we cannot wait to have the prints hanging on our walls. Lenny and Melissa are so accommodating, so encouraging, and they make you feel like models! !